We are offering MS Scaffolding System. We are a manufacturer and exporter of high quality U Frame Scaffolding Systems. 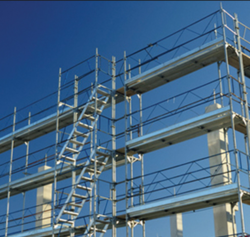 Our range of products comprise of premium quality Scaffolding System. This system is well known for being highly convenient to install. It has lower needs for regular maintenance. 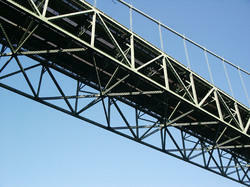 We are the leading manufactures and suppliers of the Lift Shaft Scaffoldings. Manufactured out of high quality raw materials as per the standards of the international market. We are looking queries only from Maharashtra. CUPLOK's unique locking action makes it the fastest, safest, most economical & widely-used scaffolding system in the world. The unique method of connecting Horizontals to Verticals in one single action. The locking device is formed by two cups. Fixed lower cup which is welded to Verticals and a sliding Upper cup is moved down and rotated by light hammer blow to give a positive and rigid locking.